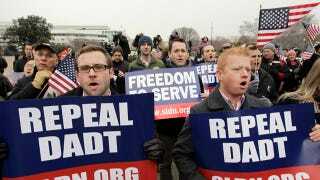 The Pentagon has announced that "Don't Ask, Don't Tell" will be officially repealed on Tuesday, but Republicans are having a hard time accepting that the military won't be allowed to discriminate against homosexuals anymore. This week two Republicans on the House Armed Services Committee asked Defense Secretary Leon Panetta to delay the repeal because Congress hasn't seen a copy of the new rules yet. "Committee officials have requested, but not received, copies of the revised regulations and a summary of all the specific policy changes, especially with regard to benefits, that will take effect upon repeal. This failure to meet the committee's requests leads us to conclude that decisions on the policies and regulations to implement repeal are not complete and that your certification and those of the others were inaccurate." They add that the repeal date must be postponed because the new regulations and policies need to undergo a "review and comment period" before they go into effect, and since they haven't been asked to pick apart the new rules it's "evident that the department does not have final, approved policies in place." Unsurprisingly, there's no requirement that the new regulations be presented to the House, the representatives were just hoping that months after President Obama repealed the policy, they'd somehow be able to reopen debate. Army veteran and Servicemembers Legal Defense Network Executive Director Aubrey Sarvis says that McKeon and Wilson are "simply wrong," adding, "The statute only requires that the new regulations be prepared – not issued – before certification." "The repeal of 'don't ask, don't tell' will occur, in accordance with the law and after a rigorous certification process, on September 20 ... Senior Department of Defense officials have advised Congress of changes to regulations and policies associated with repeal. We take that obligation seriously. Senior department officials, including the general counsel, have met with House Armed Services Committee staff and shared with them all of the proposed revisions to the regulations and new policies to be promulgated." General Carter Ham, who co-directed the Pentgon study on allowing homosexuals to serve openly, said he doesn't expect there to be any protests about the new policy within the military. He told the AP, "My hope, my expectation, my belief is that it will be pretty inconsequential." Members of the military may have no problem accepting the new rules, but there are still quite a few bigots who can't handle seeing the policy finally come to an end.